PAM Cooking Spray sponsored this blog post. The opinions and text are all mine. Once the month of September hits our door, I start stressing about the holiday season. I try as much as I can to plan it but I find I always end up running like a crazy. But this year, I vowed to plan better and organize myself. One area that needs my attention is baking. I bake a lot during this season: be it for school fundraisers, family get togethers or just for the fun of it with the kids. One of my favorite and easiest recipes to bake is muffins for kids. I like baking them because my little princess can give me a hand. Besides it is a great way to have a mother/ daughter time, as well as educational time. Measuring the flour and other ingredients count as math, right? Since my daughter is a chocolate fan (and who isn’t? ), I decided to test an easy and healthy chocolate muffin recipe for kids this upcoming holiday season. In a bowl, mix the dry ingredients: flour, baking powder, baking soda, salt. In a separate bowl, mix the sweetener and cocoa. Add the eggs and beat on high speed until it becomes smooth. This is my daughter’s favorite thing: cracking the eggs and beating them. Slowly add the dry ingredients. I usually add them while my daughter pours milk slowly. Spray PAM Cooking Spray on the cupcakes liners. And let me tell you it was a lifesaver. One of my pet peeves when baking muffins for kids is spraying the cupcake liners. I used to heat some margarine and add it. It was never easy. Sometimes I forget and of course muffins stick! My daughter was happy to help. She is old enough to do it by herself and was proud to do so. Bake for 20 minutes or until a toothpick comes out dry. 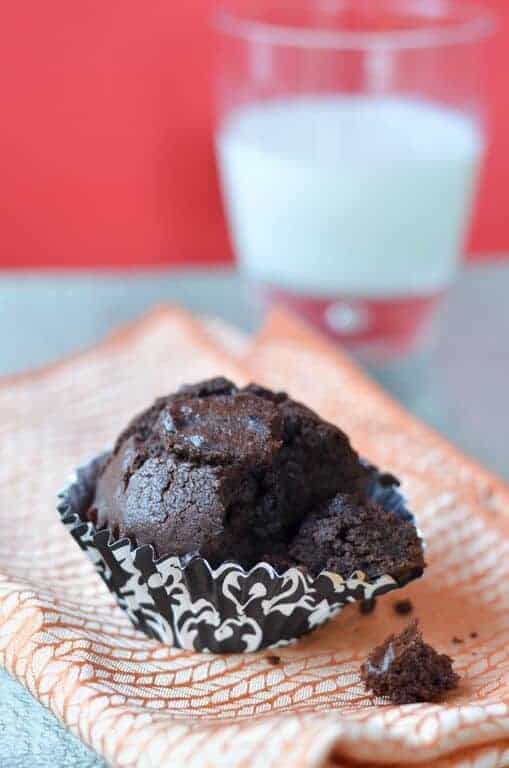 These healthy chocolate muffins for kids turned out amazing. My daughter ate one right of the oven. 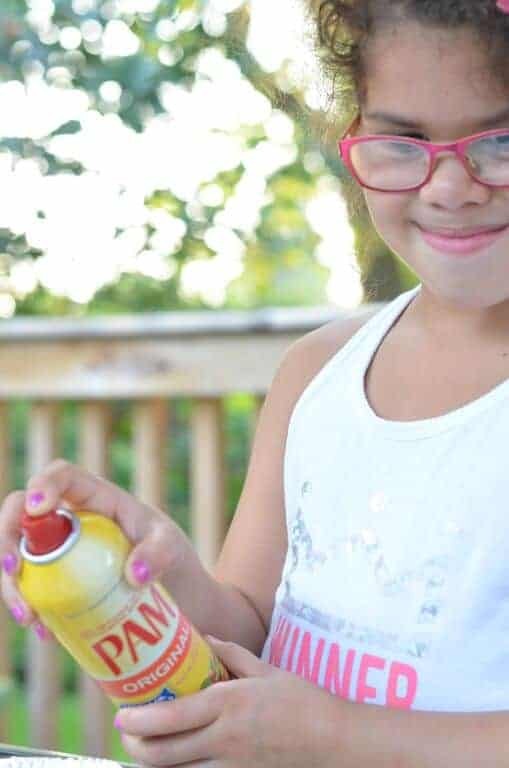 She was proud because she managed to spray PAM Cooking Spray by herself. I was delighted because these chocolate muffins did not stick to cupcakes liners. They were easy to take out. PAM Cooking spray made my life easier and will help me get through the holiday season in a breeze. Plus, since PAM Cooking Spray leaves 99% less residue than margarine or bargain-brand cooking sprays, cleanup is a cinch! 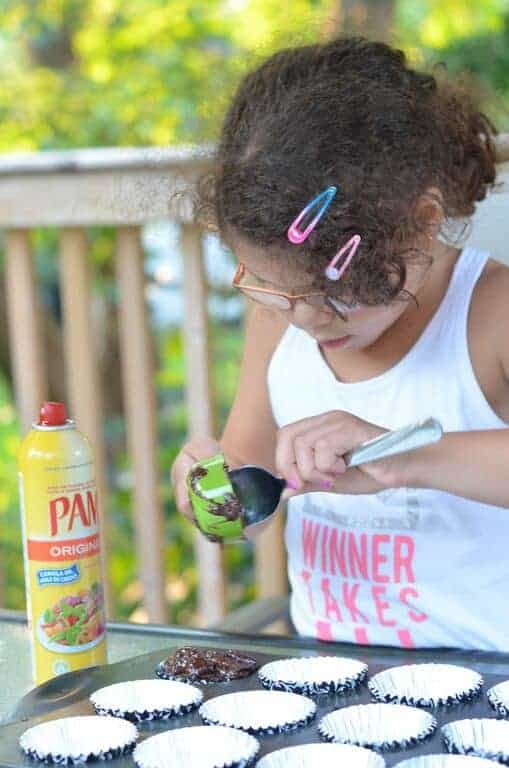 For recipes and cooking tips, follow PAM Cooking Spray on Facebook and Pinterest, or visit pamcookingspray.com. 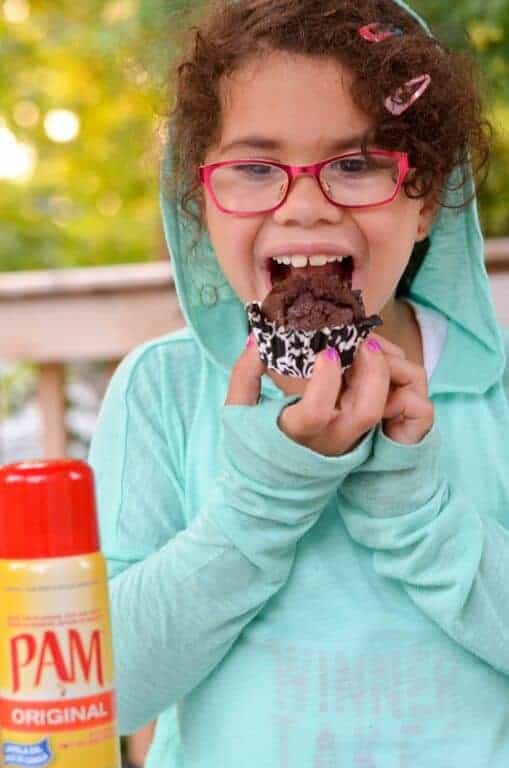 Oh my, these chocolate muffins look amazing – that you for the kid friendly recipe! This is fantastic! My kids would love this muffins, they loves to eating it. I love to bake with my niece and nephews. They have so much fun helping and this would be a great recipe for them to do too. We will have to make these chocolate muffins for sure. Thanks for sharing the recipe. For kids?? How about for me! Lol! I love chocolate muffins and these look amazing! I’ve been wanting to bake muffins and of course, it’s got to be chocolate because I am a certified chocoholic. 🙂 Looks like your recipe is easy indeed. Can’t wait to bake! I love how serious she is working on it on that last shot. I always buy Pam cooking spray. LOL, she takes her baking very seriously. These muffins look so good. I love a good chocolate muffin and anything chocolate in our house is gone in minutes! Can’t wait to make these. Now these sound way too good. We’re always craving chocolate and these would be perfect in the morning. Indeed they are. I love they don’t stick. PAM Cooking spray is a lifesaver. These looks deicious, and I love to cook with my daughter, too! So nice to see that your daughter is learning how to bake. I’m sure it is a time that she will always remember. I find it is important to teach kids these basic skills. Those look really tasty. I’m all about easy, AND I’m all about chocolate. Chocolate is the best, isn’t it? Those look so good! I can tell just by the pictures that they’re chock full of chocolatey goodness. Muffins are one my boys favorites. We make them often in our house. Your chocolate ones sound awesome. My kids are huge fans of chocolate muffins.